Come and join the very big Fremantle GROWERS GREEN FARMERS MARKET tomorrow Sunday from 8-12 am at the South Fremantle Senior High School on Lefroy Road. 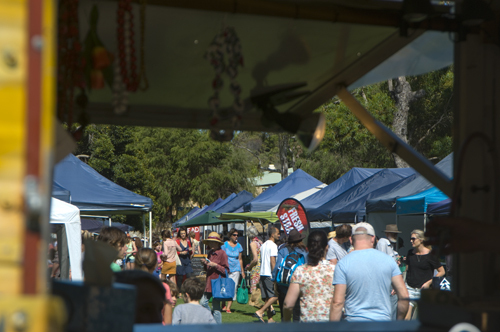 Relax and enjoy the music while sampling good food from the many food stalls, have a great coffee, wander along and but fresh food, vegies, bread, fish, meat, baskets, rugs, bric a brac, clothes, have a massage and face painting and just be part of the Freo community. There will be a very big Fremantle Growers Green Farmers Markets tomorrow-Sunday at Lefroy Road, with heaps of stalls selling goodies and fresh produce. I love the GG because of it’s outstanding community atmosphere and relaxed ambience, so I will be there sometime between 8 am and noon. See you there! The very Freo Fremantle GROWERS GREEN MARKETS are on again this Sunday from 8 am to 12 noon at the South Fremantle Senior High School on Lefroy Road. Bread, pastries, meat, fish, eggs, organic, fruit, vegetables, preserves, flowers, food stalls with yummy breakfast offerings, great coffee, community connection, children entertainment, live music. All together a great celebration of life and the unique Freo lifestyle! The event is organised by the school’s P&C, so it is a great way to support a local school while having fun and do the weekly shopping. I love markets and that probably is because my father used to take me to the markets on Saturday mornings in The Hague, Netherlands, when I was a child. Whenever I travel markets are a priority on my agenda because they show the real culture and community of a place. It is amazing to read that the city of Barcelona in Spain has some 80 permanent markets and that most residents live within 15 minutes from a market there. In Fremantle we are also blessed with the Fremantle and E Shed Markets, the Mad Hatter, the Victoria Quay one, the Princess May Markets on Friday nights and the beach market on Saturdays, and of course it has now become tradition for many Freo people to catch up with friends while shopping for food at the GROWERS GREEN MARKETS on Sunday mornings. I took some photos there on Sunday to inspire you to visit the HUGE extended market coming Sunday. GROWERS GREEN NEEDS TO BE SEEN! I love the community aspect and the atmosphere of the Fremantle GROWERS GREEN MARKETS at the South Fremantle Senior High School. It is such a relaxed ambience and perfect to catch up with friends for a Sunday morning breakfast or coffee while shopping for food. There are a lot of free range and organic products, fantastic breads and pastries, meat and fish, vegetables and fruits. Whatever is needed to cook great meals can be bought at the GG. The breakfast menu is more extensive than any cafe with a large variety of international food stalls, and the kids won’t be bored because there is plenty to do for them as well. 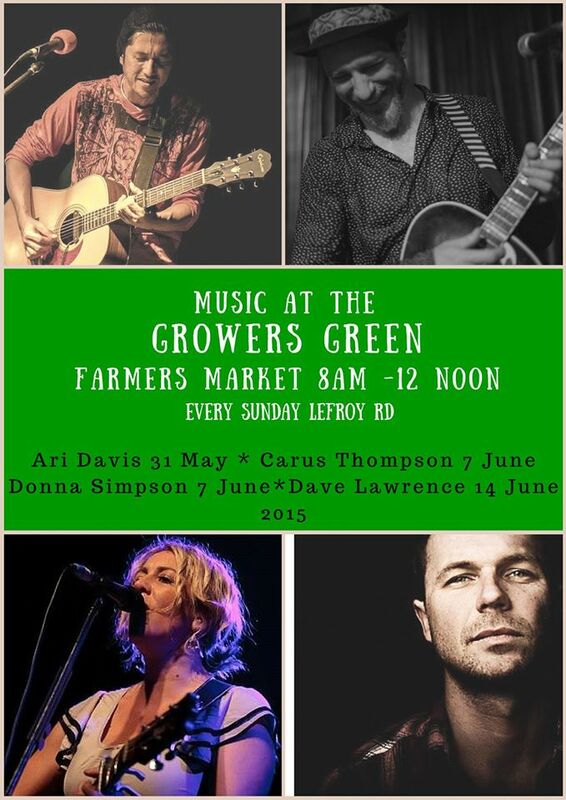 The Growers Green is on each Sunday from 8 am till noon. 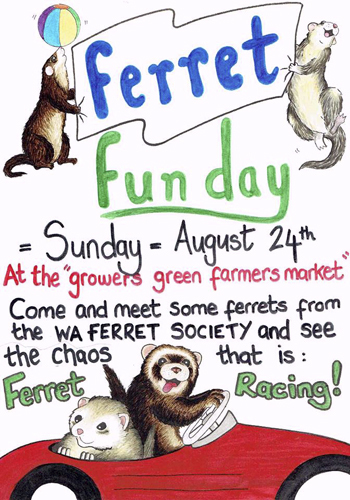 That delightful Sunday Fremantle community fresh market GROWERS GREEN is offering even more this Sunday with a display of cute ferrets and ferret racing. The kids will love it, so make the trip to Lefroy Road between 8-12, buy fruit, vegies, breads, etc. and connect with your Freo community.